The Mi-171SH-HV military transport helicopter variant was unveiled in July 2017. Image courtesy of The Union of Machine Builders of Russia. The Mi-171SH-HV is a new variant of the Mi-8/17 family of multi-mission helicopters. Image courtesy of The Union of Machine Builders of Russia. The Mi-171SH-HV helicopter is equipped with President-C air defence complex. Image courtesy of KRET. JSC Russian Нelicopters unveiled Mi-171SH-HV military transport helicopter at the MAKS-2017 International Aviation and Space Show held in Moscow, Russia, in July 2017. It is a new variant in the Mi-8/17 family of multi-mission helicopters. Designed for use by the special forces, the Mi-171SH-HV variant comes with advanced navigation and surveillance equipment, powerplant and combat efficiency. It can be used for a wide range of missions, including ground attack and personnel / cargo transportation. The Mi-171SH-HV military transport helicopter is designed by JSC Ulan-Ude Aviation Plant based on the Mi-8/17. It is manned by three crew members and is capable of carrying up to 28 personnel. The composite five-blade main rotor assembly improves the helicopter’s performance. The tail rotor assembly has four blades configured in X-shape. The helicopter’s take-off and landing operations are supported by a landing gear assembly consisting of two single-leg main gears and a double-wheeled nose gear. The fuselage is outfitted with sliding doors on each side of the cabin for passengers. A hydraulic cargo ramp at the rear allows for loading and unloading of cargo. The helicopter has a payload capacity of approximately 4,000kg and a maximum take-off weight of 13,500kg. The Mi-171SH-HV military transport helicopter variant is equipped with six external hardpoints for carriage of missiles, rockets, weapons and guided bombs. Up to eight Ataka anti-tank guided missiles, four mounted on each side, are used to destroy main battle tanks with explosive reactive armour. Two OFAB-250 high-explosive fragmentation incendiary bombs are carried to defeat light armoured targets and fuel stores. A UPK-23-250 gun pod with GSh-23 twin-barrelled autocannon is fitted to provide a high rate of fire against enemy aircraft. The helicopter carries two 12.7mm-calibre Kord machine guns near the left and right doors. An additional two 12.7mm-calibre bow machine guns are suspended on the truss structure. 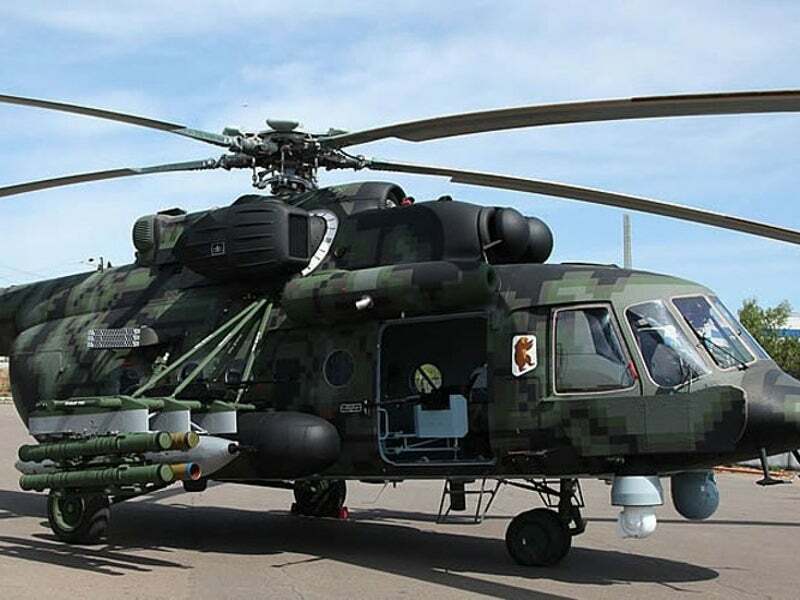 Mi-171SH-HV’s weaponry also includes two S-8 rocket launchers and a 7.62mm PKM medium machine gun, which is mounted at the rear. The cockpit and cargo cabin floors are equipped with a spall liner, which is made using removable lightweight Kevlar armour to provide increased protection for the occupants. Kevlar armour is also installed on the left and starboard sides near the portholes. The energy absorption ability of the seats provides superior protection to the crew members. The crashworthy design of the landing gear provides improved survivability for the personnel during landing operations. The Mi-171SH-HV multi-mission helicopter features a glass cockpit with new flight-navigation equipment, digital autopilot, and reliable analogue instruments. The cockpit with night vision goggle compatibility offers high-combat survivability for the helicopter in hostile environments, during both the day and night. Situational awareness for the crew is provided by electro-optical systems mounted in two gyro-stabilised platforms located below the nose section. The Mi-171SH-HV variant also incorporates forward-looking infrared radar (FLIR) system, searchlight, dual-band antenna, and infrared emitter. The Mi-171SH-HV is installed with the President-C air defence complex developed by KRET to counter threats from enemy surface-to-air missiles, man-portable air defence missile systems (MANPADS) and other short-range anti-aircraft missile systems equipped with infrared and radar homing guidance systems. Powered by two advanced turboshaft engines, the Mi-171Sh-VN military transport helicopter offers a cruise speed of 260km/h and a maximum speed of 280km/h. It is provided with increased thrust-to-weight ratio over its base variant and has the ability to fly at high altitudes under difficult climatic conditions.